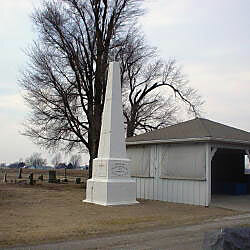 Description: 12' Concrete monument with a flagpole. 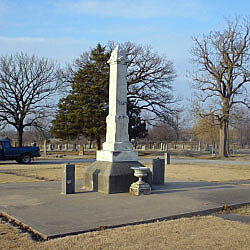 The inscription on the monument reads: "Erected By ~ Shiloh Post 56 G.A.R. ~ 1912 ~ In Memory Of ~ Soldiers War Of 1861-65". 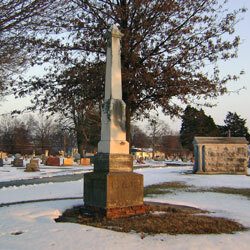 Description: An 18' granite monument is placed in the Girard Cemetery. A commemorative urn is placed in front of it. The inscription on the monument reads: "Erected By Gen Bailey ~ Women's Relief Corp ~ No 120 ~ Girard Kansas ~ 1892" On the side of the monument is: "In Memory ~ Of ~ The Unknown Dead ~ That Fell In The ~ Civil War Of ~ 1861-1865" This monument is reported to have cost $500. 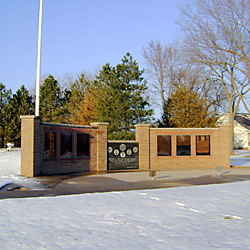 Description: The central slate panel is engraved: "This flag is lifted high and flies gallantly ~ above this memorial in honor of those ~ who served from those who care. ~ May God bless you all. ~ Dedicated May 4, 1991". Seals of the five branches of the modern US Military and an American Legion seal are above the inscription. Side panels list names identified as Korea, Vietnam, Lebanon, Grenada, Panama, Desert Storm. Description: Granite spire on a stone base. The spire has engraved emblems of the various orders. The inscription on the spire reads: "Erected By ~ WRC Badge ~ No. 98 ~ May 30 ~ 1893 ~ In Memory of ~ the unknown ~ dead ~ that fell in ~ the war 1861-65". The base reads: "G.A.R." 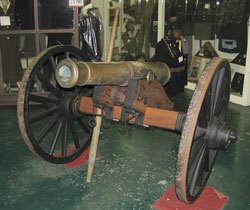 Description: Spanish smoothbore bronze 6-pdr reported by museum records to have been captured by US Army during Mexican War, given an 1844 carriage at Watersvliet NY, and later used by both Union and Confederate armies during Civil War. A smoothbore, it has a bore diameter of 3.67 and overall length of 62.87.